AS IT STANDS: When Is Trump Going to Dump Melania for Ann Coulter? 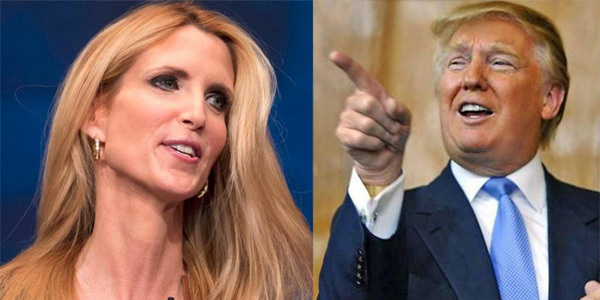 When Is Trump Going to Dump Melania for Ann Coulter? It would be a match made in hell. Imagine that Trump got tired of Melania slapping his hand away every time he tried to hold it, and divorced her? It would be number four, but Ann Coulter would really be his ideal partner. They both thrive on insulting people. They both love to tweet their inner frustrations and imagined victories. They both lie at the drop of a dime. ...went late into Sunday night. She fired off a salvo of 32 combative tweets (not including re-tweets) at Delta Airlines because they made her move from her paid-for seat with extra room, to another seat, on a flight from New York City to West Palm Beach, Florida. Coulter’s tweets were filled with insults to the airline’s flight attendants, employee screening and training, WiFi, even the woman who was assigned to Coulter’s original seat — she called her a "dachshund-legged" woman in one tweet. After sustaining the barrage for more than 24 hours, the airline responded Sunday night. “We are sorry that the customer did not receive the seat she reserved and paid for,” Delta said in a statement posted to its website. “More importantly, we are disappointed that the customer has chosen to publicly attack our employees and other customers by posting derogatory and slanderous comments and photos in social media. But Trump would have been proud if that was his woman. It's easy to see how much these two have in common. Their both rude and crude. There was a scene out of the movie "Deliverance" where a man starts dueling an Appalachian boy with his banjo. One plays for a moment, then the other responds. Great scene. In a bizarre update, I can see Trump and Coulter dueling on twitter - each playfully insulting the other one and anyone else who dares to chime in.